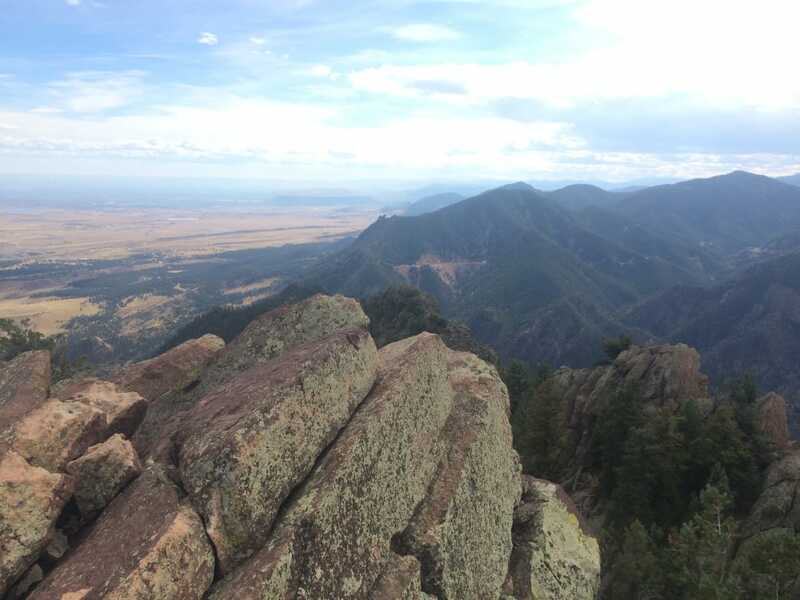 The pointy 8,461-foot summit of Bear Peak grabs your eye along the skyline west of Boulder, claiming attention it deserves but hasn’t quite yet earned. Hiding just beyond it and harder to see is South Boulder Peak, which—at 8,549 feet—has Bear Peak barely beat, height-wise. But instead of picking one over the other of these two lofty summits, why not opt to top out on both of these killer Colorado peaks in one strenuous day? 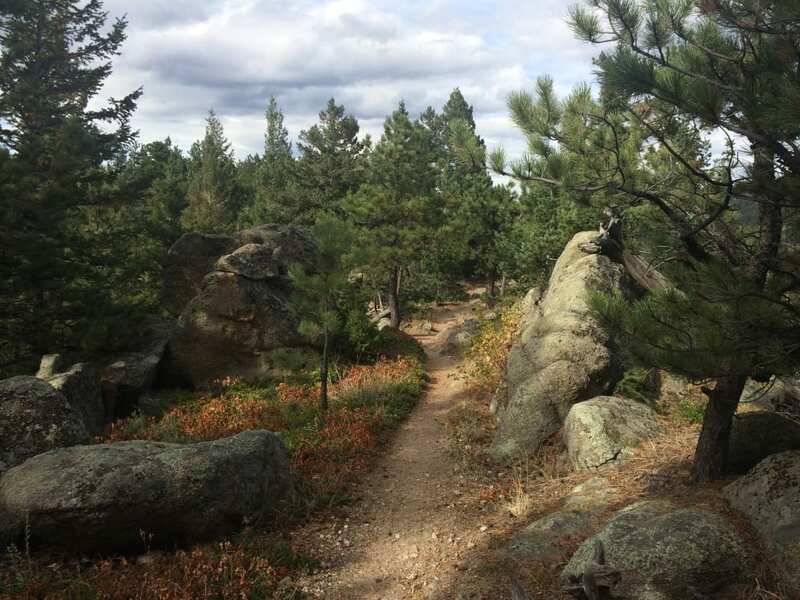 Yes, the tangled network of trails in the mountain parks west of town can be confusing. 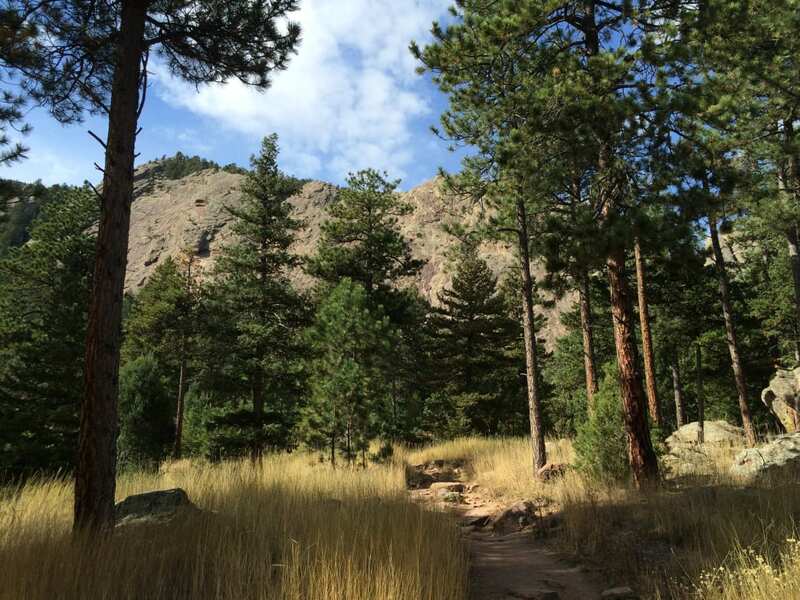 Here we offer step-by-step instructions for knocking off Bear and South Boulder peaks in one go, an excursion that involves a hike of 10.5 miles with more than 3,300 feet of climbing. 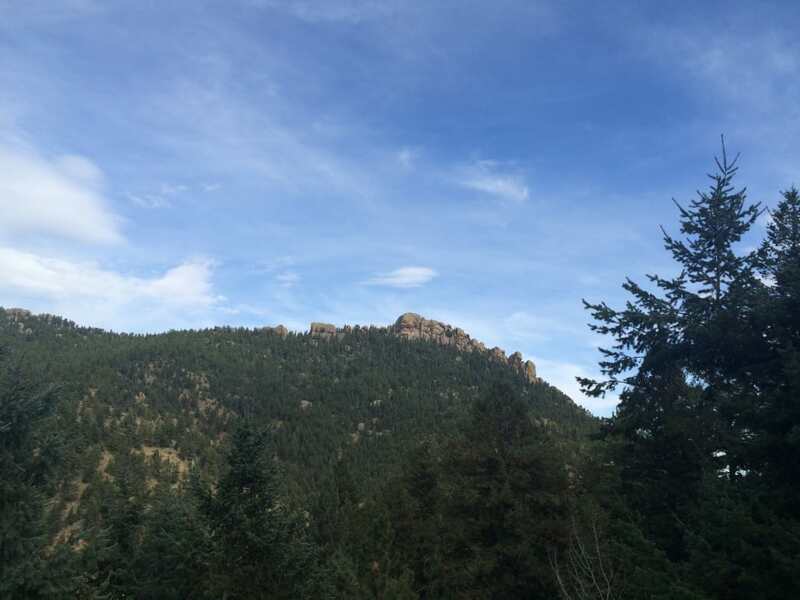 You’ll follow Fern Canyon up Bear Peak, cross the saddle to South Boulder Peak, and then return via Bear Canyon. This hike is doable year-round but can get slippery, so bring snow cleats if there’s any chance of snow on the trail. 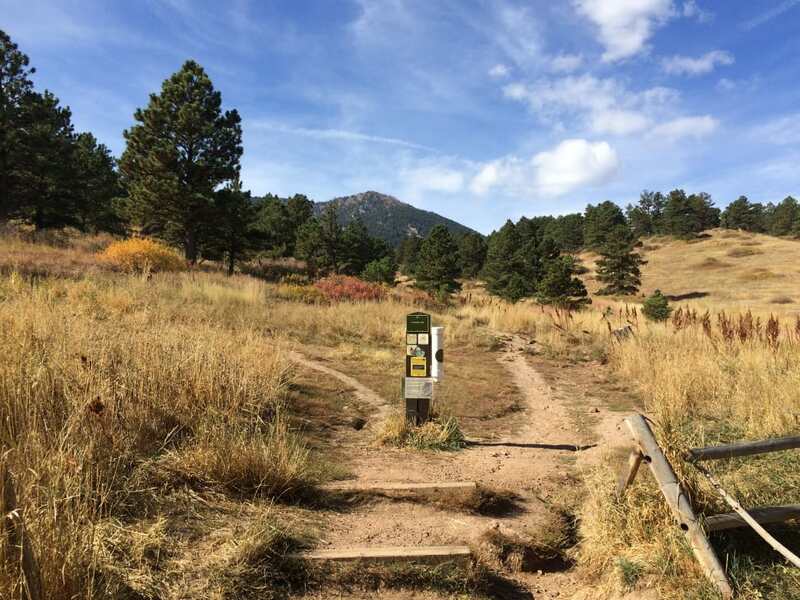 The trailhead at Cragmoor Road is a locals’ secret. 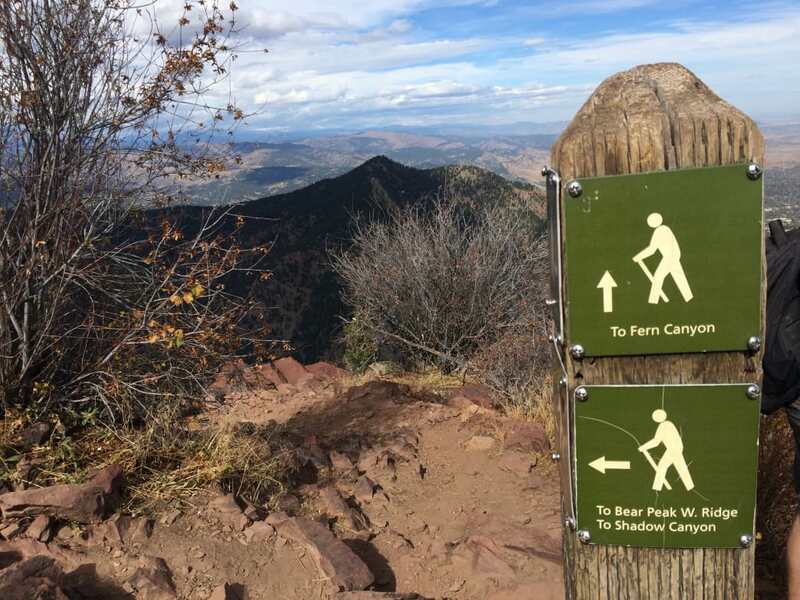 To climb Bear Peak, you have three trailhead options. The first and most popular is NCAR, above Table Mesa Drive. This route requires you to do a big climb back up to the parking lot at the end. 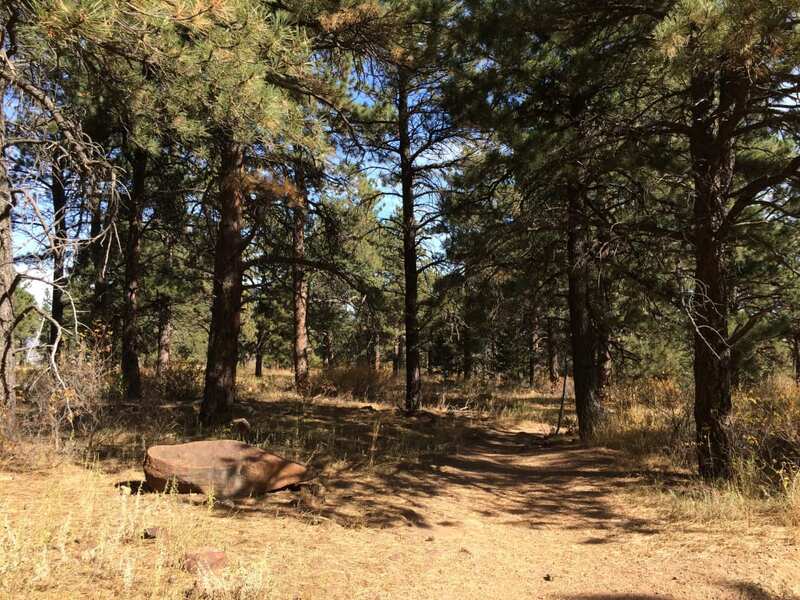 The second option is up Shadow Canyon, accessed from the South Mesa Trailhead off Eldorado Springs Drive south of town. This is beautiful but very long. Our favorite (and most insider) approach is from the trailhead at Cragmoor Road. To get there, drive west on Table Mesa and turn left on Lehigh. After 3/4 mile, turn right on Cragmoor Road and follow it until it dead-ends into the trailhead. Once you arrive, you’ll feel like you’re in on a sweet little secret (because, well, you are). At the start, take the right-hand trail that says “To Shanahan Trail.” Almost immediately the trail forks again. Stay left on the trail with the log steps. Start climbing and settle into a sustainable pace: You’ll be going uphill with few breaks for quite a long way. Make note of the rock that marks the turnoff from the Shanahan Ridge Trail. You’ll need this on the way down. Soon the trail meets the wide Shanahan Ridge Trail. Turn right, and pause for a moment to look back and notice the rock at the trail junction. This is your landmark to indicate where to turn on the way down. As you walk up Shanahan Ridge, keep an eye to the left for the small pond where your pooch might want to take a swim. When you get to the junction with the Mesa Trail, keep going straight towards Fern Canyon. Soon a Flatiron starts to dominate your view. You’ll skirt the base of this before beginning the long grunt up Fern Canyon. At the start of the canyon, the narrow gulley amplifies bird calls, lending an almost tropics-like soundtrack to the mountain landscape. The trail beelines for the base of this slabby rock. At the next junction, turn left onto the Fern Canyon Trail. Put your head down and get to work. The trail becomes very steep and rocky (the word Stairmaster might come to mind). But keep climbing—it’s worth it. When the switchbacks start, start counting them if you need something to distract you from the pain. You’ll get to 25 before cresting the saddle. 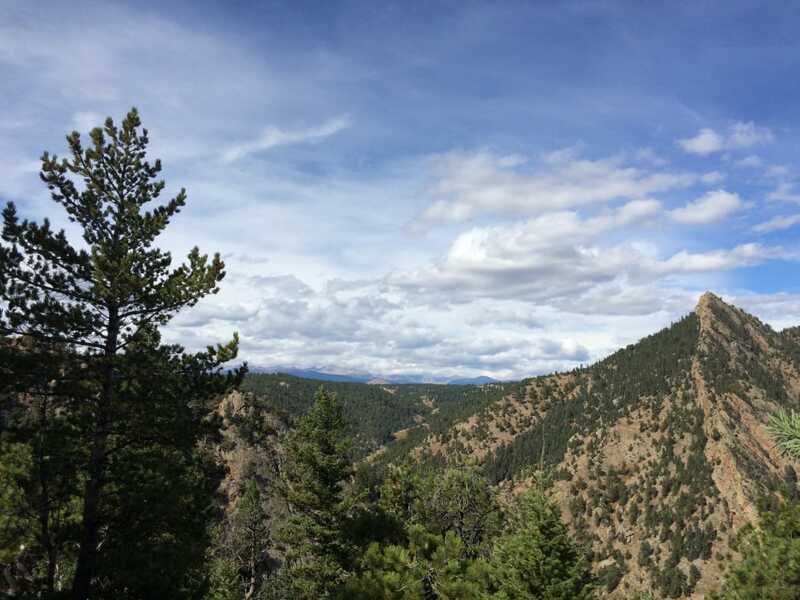 Stop to catch your breath and take in the views, which stretch west to the Continental Divide. The views from the Bear Peak saddle give you a good excuse to stop for a rest. Here’s it’s easy to flirt with the idea that you’re almost there. Put that thought out of your head: You still have a long grunt to the top. From here the trail becomes steep and loose. Watch your footing and use eagle eyes to follow the trail. (It’s easy to wander off course.) Keep an eye out for a small stand of aspens—one of the few around these parts. Keep climbing as your calves start to scream. When you get to the burn zone, you know you’re getting close. The final push is a rocky scramble up a talus slope. If you’re not afraid of exposure, scramble along the narrow ridge to the true summit of Bear Peak. 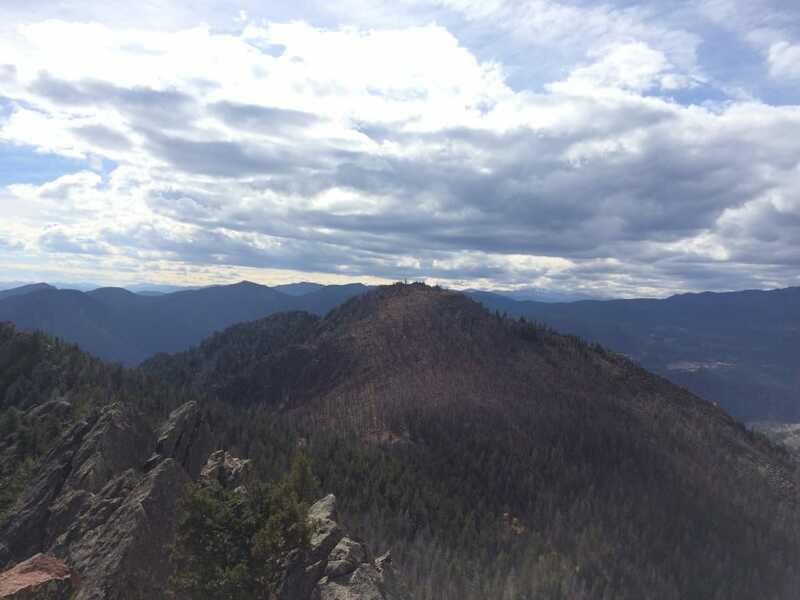 From the top of Bear Peak, you can see South Boulder Peak’s burned summit to the south. Don’t worry: It’s closer than it looks. Take in the 360-degree views. To the south you can see your next objective, the burned summit of South Boulder Peak. Don’t worry: It’s closer than it looks. Don’t back down now. When you’re rested, head back down the rocky summit and turn left, following the sign that says to Bear Peak West Ridge and Shadow Canyon. After you scramble back down Bear Peak’s pointy top, take a left to head toward South Boulder Peak (Bear Peak W. Ridge and Shadow Canyon). This immediately wraps around the backside of Bear Peak and starts to descend to the south saddle. It’s 10 minutes to the saddle and another 10 to the top of South Boulder Peak, whose summit sees far fewer hikers. The final approach through the burn zone (from a 2012 fire) feels otherworldly. Look and listen for woodpeckers tapping their beaks at the charred trunks. In late summer, you might even be able to pick wild raspberries from alongside the trail. The burn zone from a 2012 fire resembles a moonscape. The final push to the summit isn’t nearly as steep as Bear Peak. From the top, you can see south into Eldorado Canyon. Bask in your accomplishment. From the top of South Boulder Peak, you can see into Eldorado Canyon. When you’re ready to roll, head back down to the saddle and retrace your steps toward Bear Peak. At the backside, turn left onto Bear Creek West Ridge. This is a longer route than the way you came up, but well worth it for the stunning scenery and westerly views. On the west ridge, you’ll descend steeply through a vastly different landscape punctuated with rocky outcroppings. 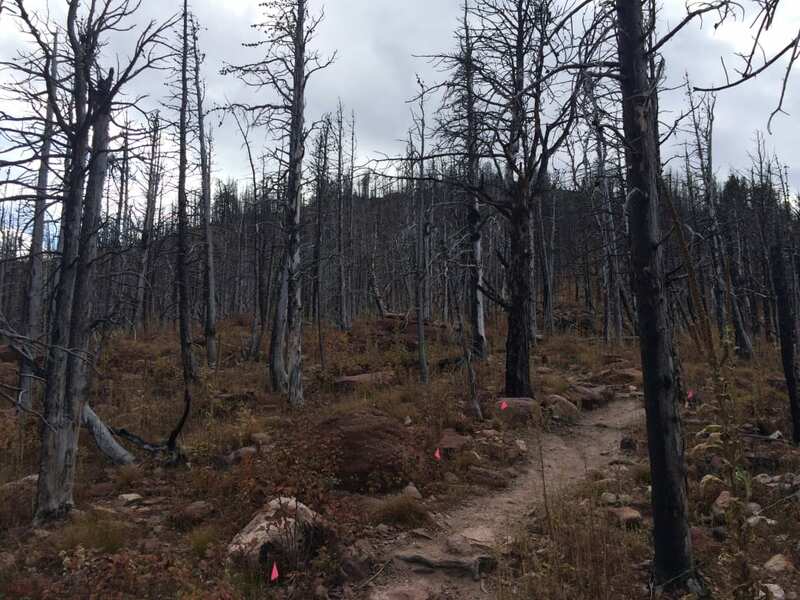 The trail passes through a long stretch of burn zone before re-entering green trees and descending into Bear Canyon, a beautiful, peaceful place. The landscape on the west side of Bear Peak is dramatically different from the eastern approach. Listen to ravens calling in the distance and look for the view of the backside of Bear Peak, which looks more like a cliff band from this perspective. The trail down the canyon gradually contours around the hillsides, making it easy on the knees. Rather than a quad burner, it’s a pleasant (albeit long) stroll through the woods. The west side of Bear Peak lacks the pointy tip you see from the east. When you get to the junction of the Mesa Trail, turn right. (Left would take you to the trailhead at NCAR.) You face one more uphill stretch, which will tell you how tired your legs are. Pass the junction to Fern Canyon, then bear right at the next junction to stay on the Mesa Trail. After what seems like forever but is less than ½ mile, you reach the junction with the North Fork Shanahan Trail where you started. Retrace your steps back to your car, keeping an eye out for that rock on the left that signals the last turn. The whole trip will take you four to five hours, depending on your speed. Make sure to pack snacks and rain gear since any way you slice it, you’re in for a long walk in the woods.